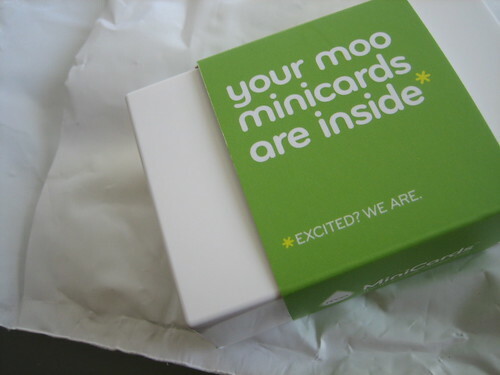 Yes, indeed, my moo minicards came yesterday! Hurrah for mail! Hurrah I say! My own design, which makes me happy. I think the coral one is my favorite. The white one turned out a wee bit grainy, but only if you look really close. So, I won't be hating. But I am glad I went with the color ones, too. The box came with 100 cards, so I'm going to be giving them out all over the place, and also putting one in with every order over at the store. these are adorable! I wish I could make some just because they're so cute. I want to eat them! Yay! They look great! I love em! That is super cool that they're your own design! I like the coral and the blue ones too! SO cute!!! Hee-- you are so freakin hilarious!-- I love that you threatened to eat our families if we stalk you! Your last name sounds so fancy! Is that your handwriting? I'm jealous. oh those are so cute, i love them! I love them!! Those little moo cards are just so cute. I will have to get some myself. And your design is very sweet. Whee! I'm glad you got the letter and liked the note cards. I will be on the lookout for your letter. It's fun to put away craft ideas. I must have a million now I swear. I hope you feel better as well. they look beautiful! you did such a great job! so nice! i love them. totally adorable. Wow. Now my blog crush (platonic, of course) totally makes sense! My best friend, the good half of me, lives in another body in Georgia, called Kerri. Same spelling and everything. We have matching tattoos (and no we are not gay). So, the blog world is starting to make a little more sense now! Your cards are great. My sister is an aesthetician and orders her own cards that way. 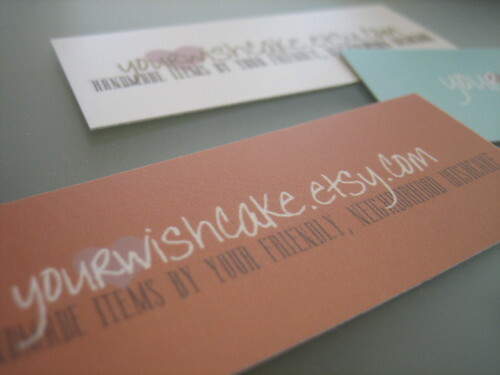 I want to make some with my blog address to pass out to people I meet at BlogHer!